Two recent New Jersey accidents resulting from wrong-way drivers sent a number of people to the hospital, and demonstrate the rare but dangerous result of head-on collisions. In the early hours of July 9, 2016 the driver of a black Dodge Charger was traveling north in the southbound lane of State Highway 47 in Dennisville. As he drove, a silver Toyota Highlander traveling south in the southbound lane met the Charger. The Highlander driver attempted to avoid a collision with the Charger by veering into the Northbound lane, but the Charger struck the rear of the Highlander and caused it to roll over. The Highlander came to a stop in the northbound lane, but the Charger continued. A red Kia Sorento then approached, traveling south in the southbound lane, and hit the Charger head-on. Both the Charger and Sorento came to a stop after this crash, with the Kia in the northbound lane and the Charger in the southbound lane. The driver of the Charger was taken to the hospital for evaluation, and was later charged for driving under the influence and for possession of a controlled substance with intent to distribute. The drivers and passengers of the Sorento and Highlander sustained what appeared to be non-life-threatening injuries. In another incident on the same day, the driver of a Toyota pickup caused injuries to seven people when driving on the wrong side of the road. The Toyota was traveling east on Lacey Road in Lacey when it crossed into the westbound lane. The Toyota collided with a Chevrolet pickup, causing it to roll over multiple times and come to rest in the woods by the side of the road. The Toyota continued driving against traffic in the westbound lane and collided with a Saturn Vue. The driver and passenger in the Saturn were hospitalized with serious injuries, as was the driver of the Toyota. The driver and three passengers in the overturned Chevrolet were treated for minor injuries. Head-on crashes are one of the most deadly types of motor vehicle collisions. While accounting for only 2% of all crashes on US roads annually, they account for approximately 10% of all roadway fatalities. Even more than other types of accidents, head-on collisions tend to result from grossly negligent or reckless behavior, such as driving while intoxicated, driving while distracted from texting or talking on the phone, or falling asleep behind the wheel when driving while fatigued. Head-on collisions can also result from an elderly driver becoming confused when behind the wheel and steering into the wrong lane of traffic. 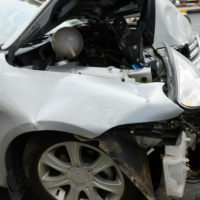 Head-on collisions often cause serious injuries in the victims. These victims may have claims for punitive damages against an at-fault driver who was behaving highly recklessly by driving while seriously intoxicated or at an extremely high rate of speed. If you’ve been injured in a head-on collision in New Jersey, seek the money damages you deserve for your medical bills, lost work, and pain and suffering by contacting the compassionate, knowledgeable, and trial-ready Wayne personal injury attorneys at Massood Law Group for a consultation, at 973-696-1900.